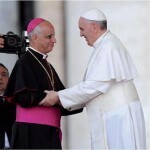 Will Pope Francis Really Change Catholic Doctrine? Pope Francis’s address for the 25th anniversary of the Catechism of the Catholic Church made a strong impression both for its hint of a possibility of changing Catholic teaching on the death penalty (still permitted acording to the Catechism, though only as an extrema ratio) and for the Pope’s statement that doctrine is not immutable. However, there was a quote in the speech that passed almost unobserved. And this quote is more meaningful than it seems. Pope Francis quoted St. Vincent of Lerins, a Church Father of the fifth century whose life is more obscure than his writings. In his address the Pope quoted a passage from Commonitorium, the only complete work by St. Vincent of Lerins to survive until today. St. Vincent wrote, “But someone will say, perhaps, ‘Will there be no progress in Christ’s Church?’ Certainly there will be – all possible progress. For what being is there so envious of men, so full of hatred for God, who would seek to forbid it?”. This quotation is significant for two reasons. The first is that in it Pope Francis underscores that whoever “tries to prevent” progress in religion is indirectly considered by the Pope as “hateful of God.” The second reason is that it is not the first time the Pope quotes St. Vincent of Lerins. He already did so in the interview he granted to the Jesuit-run magazine La Civiltà Cattolica back in 2013 – it was the first interview of Francis as Pope. In the interview, he said: “St. Vincent of Lerins makes a comparison between the biological development of man and the transmission from one era to another of the deposit of faith, which grows and is strengthened with time. Here, human self-understanding changes with time and so also human consciousness deepens” (there were other quotes of St. Vincent of Lerins in that interview, always on this same topic). Vincent of Lerins helps us to clarify Pope Francis’s rationale. In general, the proposition that doctrine develops has been accepted by most theologians. The fact is, however, that only a few agree about the way doctrine develops. Re-reading St. Vincent’s text, one understands that the Pope does not want to change the deposit of faith. This will stay the same. In fact, Francis showed a certain affection for the traditional thought of the Church when he spoke about the Church as a “holy hierarchical mother,” for instance, or when he reiterated to priests of the Lyon Diocese in a private meeting that he has no wish to change the norms on priestly celibacy. Pope Francis’s work does not deal mainly with changes in doctrine. The Pope wants to change the way of thinking; he wants to open processes, but without closing them. He explains this point well in Evangelii Gaudium, when he lists his four guiding principles that, in the end, represent the need to wait in order to erode the conventional way of thinking and to put into practice that “pastoral conversion” which he constantly calls for. Hence, the quotation of St. Vincent of Lerins. St. Vincent does not speak about a change in the deposit of faith, but instead of a new approach, a development in doctrine, a progress that must not represent a fundamental change because it is simply a way to change the point of view. How can the Pope change the Church’s point of view? He is doing that in many ways. First of all, he opens processes. The two synods on the family represent the opening of a process. This process did not conclude with the post-synodal exhortation Amoris Laetitia, since the document leaves all the debates open – and it is in fact widely debated. When the request to ponder the possibility of admitting women to the diaconate came up, Pope Francis established a commission composed of conservative and progressive members, leaving the discussion open as a long as the commission has not concluded its work. Even his address on the Catechism appears to be a sort of opening on a theme which finds almost everyone in agreement: the issue of the death penalty. To sum it up briefly, following the evolution of the Church’s thinking on the death penalty (the Catechism views it as an extrema ratio to protect the common good, and as St. John Paul II stressed in the encyclical Evangelium Vitae, this extrema ratio nowadays is “almost non-existent”) Pope Francis proposed a pragmatic example of development that can find a common ground. The example could lead to a change in the Catechism on the issue, but it is also a test balloon: how many people are ready to admit their rigidities? How many are ready to accept a change in their point of view? Depending on the results of that test balloon, Pope Francis will likely carry forward a certain kind of evolution on minor issues, especially on issues generally linked to the social teaching of the Church. It is no mystery that the Pope is thinking about changing the doctrine on the just war, and a test balloon for this change was indicated by the Message for the World Day of Prayer for Peace on non-violence, which followed discussion of the topic at the meeting for peace in Assisi promoted by the Sant’Egidio Community. This was followed in turn by a substantial conference in the Vatican organized by the then Pontifical Council for Justice and Peace. So, there is an ongoing discussion on the topic that the Pope has blessed, but left open, without closing it. It is likely that the Pope will not close down discussion on the more hard-hitting issues on doctrine. As far as sacramental Communion for civilly divorced and remarried Catholics, the Pope has left the matter up to the couples’ discernment, whether privately or with priests. He has limited his intervention to showing appreciation for some events, without criticizing others, and while leaving in suspense the more burning issues like the dubia. In that case as well, the Pope worked like an icebreaker, and then left an opportunity for the debate to develop, so that everyone could take a position. For example, on the issue of Magnum Principium, Cardinal Robert Sarah, Prefect of the Congregation for Divine Worship and the Discipline of Sacraments, sent a letter to the Pope in order to clarify some issues. Must the translation conform to the current norms that require fidelity to the original Latin and provide criteria for the linguistic adaptation, as established in Liturgiam Authenticam? Do both the confirmatio and recognitio require the approval of the Holy See? Moreover, the Cardinal suggested to the Pope that there should be a distinction made in assessing the final result between translating and adapting, as they are different one from another. Cardinal Sarah thus hopes that even the procedures prior to the confirmation of a liturgical text will change. What does this mean in the end? That the Pope has taken some steps and allowed a debate to open, sometimes even indicating his point of view. He often justifies his point of view by mentioning 5th century writers. So, the address on the occasion of the 25th anniversary of the Catechism cannot be considered a response to the dubia, nor an official declaration about the need to change the Catechism. It was, once again, a speech that shows its own modus operandi. Everything must change so that nothing changes, and nothing changes so that everything changes: these two oxymorons are perhaps the lenses through which Pope Francis’s pontificate should be read.